Welcome! 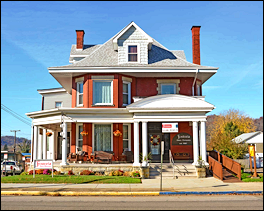 I am thrilled to have you visit and learn more about the Fostoria American pattern, Line #2056. The original debut of this website was in 2015, and since that time a lot of research, photos, and content have been added. I am proud to say that there are now over 150 informational posts available on a variety of different American items. Collectors, from the beginner to the advanced, should find the information contained within this website helpful. Individual photos should aid in identification of items. Capacity, when noted, is in ounces – as listed in various Fostoria catalogs. Measurements are in inches, and also taken from various published catalogs. Please note; however, that catalog measurements might not always be accurate. Therefore, I always measure each piece that is featured on this website and make note of it in the item description. Do expect slight variations in size, due to the handmade nature of the product and slight mould changes that might have occurred during the production years. Since I am not a licensed Appraiser, I do not give any opinions on the current market value for a particular item. Most collectors, including myself, simply go to eBay to determine what an item might be worth in today’s market. It is very easy to research the “sold” listings for your desired item, and all pricing data will be disclosed. 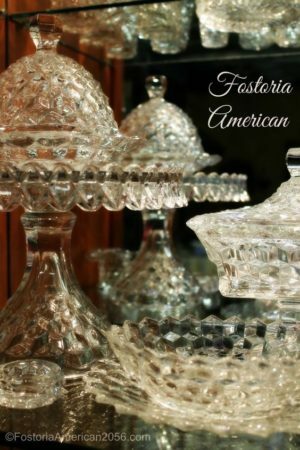 Thank you for stopping by, and I hope that you will find this website a very useful tool for your aspiring (or already established) collection of Fostoria American crystal.